Starting in 2009 BMW started selling BMWs with Advanced Diesel with BluePerformance Technology. It was released in two models: The X5 xDrive35d and the 335D sedan. While Diesels may operate very similar to a Gas/Petrol Engine they are very different in how they function. At Excluservice we have the experience, knowledge and tools to perform the most basic repairs such as Oil and Filter changes. 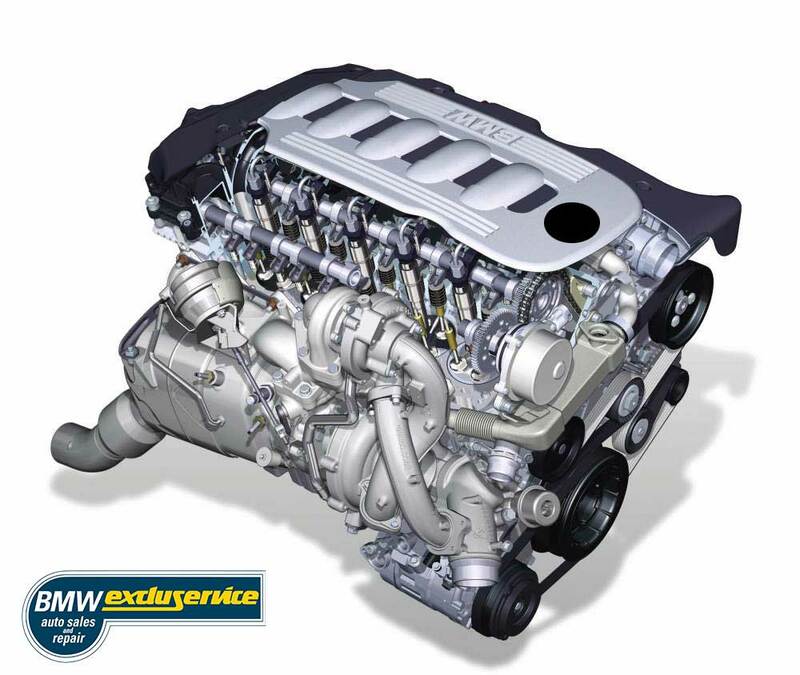 YES BMWs Diesels do require a specific oil when performing an Oil and Filter Change. You must use an oil that carries the BMW LL-04 Approval. This oil will prevent damage/clogging of the Diesel Particulate Filter “DPF”. Lately we’ve seen many cars with partially clogged DPFs. 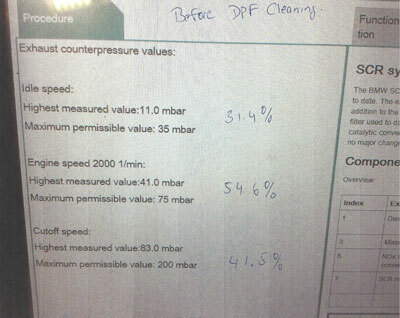 While Incorrect oil is a major cause of this there are other factors that can cause the DPF to get clogged, i.e. excessive idling, short trips, stop and go traffic. When the filter gets clogged there are typically 4 options on how to remedy the situation. Option 1: Drive the vehicle on the highway in a lower gear to increase the RPMS and make the car go through a Regeneration Procedure (We will have to make another article on this procedure). Option 2: Insert a Chemical in the DPF housing and then go through a Regeneration Procedure. Option 3: Remove the DPF from the vehicle and take it to a facility that can clean the DPF. 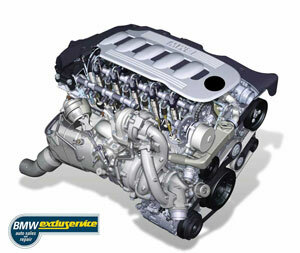 Option 4: Replace the DPF (at an extremely High Cost) with a new one from BMW. 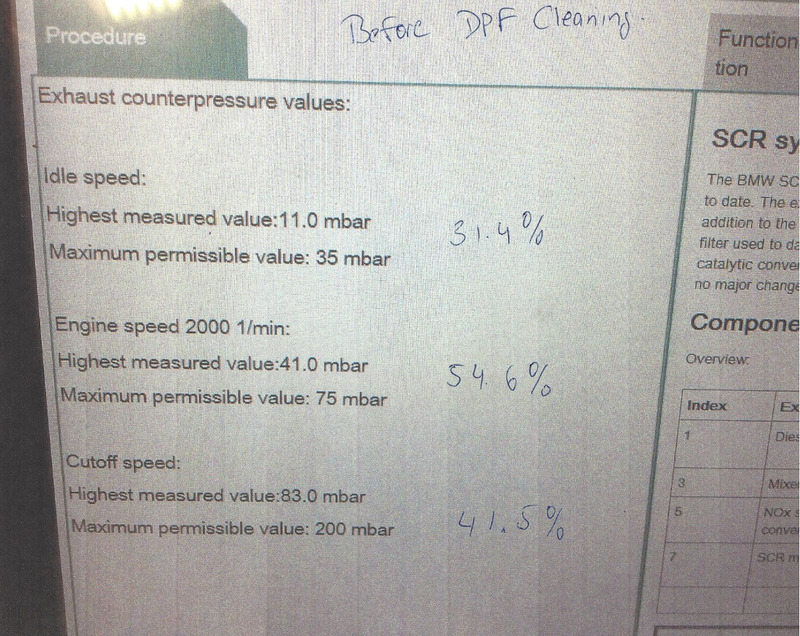 We Recently performed a Chemical Cleaning of a DPF on a 2010 BMW 335d. 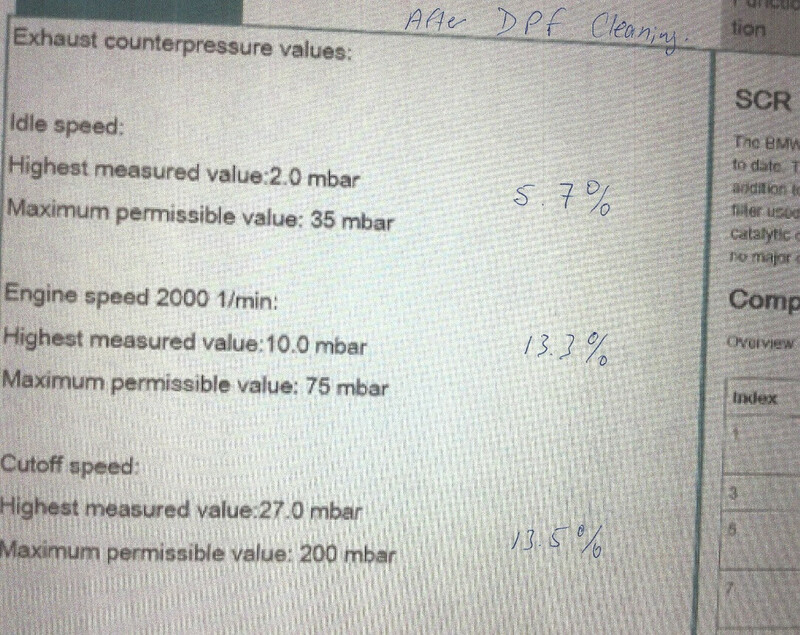 We checked the Exhaust Counter Pressure Values at varying RPMs. 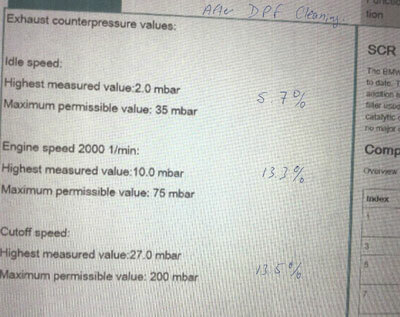 The purpose of this test is to tell you in a roundabout way How much blockage is in the DPF. You take the measure value and divide it by the maximum permissible value and this gives you a percentage. We want the percentage to be as low as possible. You can see from the calculations the improvement was significant. the highest improvements at the 2000 RPM range decreased by 41.3%. This is the most important improvement as well since it is the most used Range because this is when you would most need power to accelerate. If you have any questions about BMW Diesel please feel free to contact us.